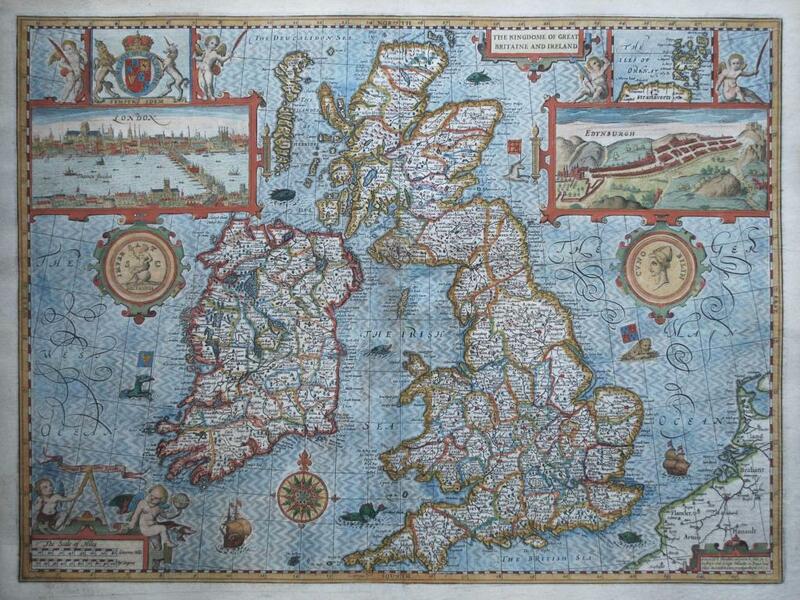 The famous map of Great Britain we often see around the place is John Speed’s 1610 map. 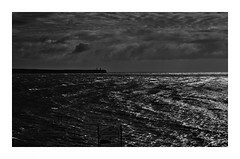 Have a look at the west coast of Ireland and the “sea monster” there. In Irish mythology dragons were called peist (pronounced: pey-ssht) and were typically water monsters, whose abode was primarily lakes and rivers. I like that this one is holding a harp, the official and modern and ancient symbol of Ireland (not the shamrock) as each on the map is here used to indicate a country or region of Great Britain..
Sea monsters were added to maps to indicate mainly that these were unexplored areas or at least areas about which little was known, and it had stopped by about the 17th century. 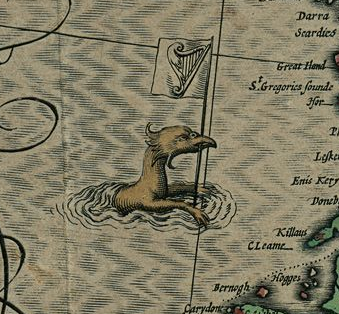 There’s a brief article on sea monsters on maps here. Here Be Monsters was apparently only ever used on one map, despite that we all know the phrase. Now, before the Irish people castigate me for using the term Great Britain to reference all of Ireland and the United Kingdom in the first image above, let me say that was in the historical context. For those of you overseas who are perpetually confused by the geographical boundaries and differences between Ireland, the United Kingdom and Great Britain, here’s a simple graphic. 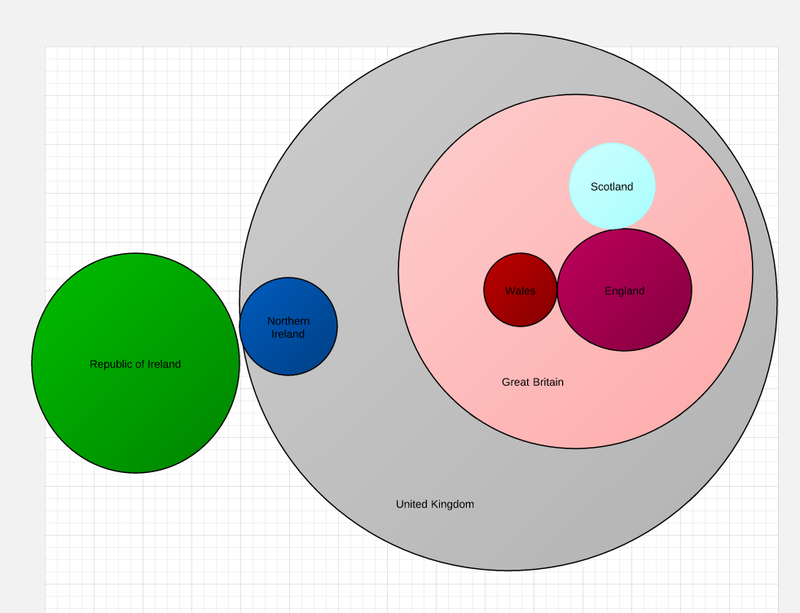 Great Britain is three countries ONLY, England Scotland and Wales. The United Kingdom … is Great Britain AND Northern Ireland. Ireland is The Republic of Ireland AND Northern Ireland. It is NOT part of any political amalgamation that includes the United Kingdom or Great Britain. The sovereign state of Ireland is called The Republic of Ireland (or Éire, or Éireann, not often used). Colloquially, Ireland is also used to refer to The Republic of Ireland. People in Ireland DO NOT USE the term British Isles. The Irish State and Government do not acknowledge it. The preferred geographical term is the Atlantic Archipelago (which includes The Channel Islands and The Isle of Man), or even the Atlantic Isles, though these are rarely used. Great Britain and Ireland, or The Islands of Ireland and Great Britain, are more commonly used. Except in Great Britain where they continue to call the region the British Isles. (And of course Dee, who will shortly argue with me about this article). (The writing is more complex than the graphic, it’s easy). Can I quote you Article 4 of the Constitution (no need to say “of Ireland”, the UK doesn’t have a constitution). This is the official name of the State. Only British law ever refers to it as the “Republic of Ireland”.